If you or your loved one has been told they have high blood pressure you may be wondering what the even means and how you can help. Blood pressure is the force of blood pushing against the artery (big blood vessel) walls as the heart beats. It’s normal for blood pressure to go up and down throughout the day, but if it stays consistently high for a long time, it can damage the heart. Smoking also increases the chance for high blood pressure. Find a local program to help you quit tobacco for good. High blood pressure is called the “silent killer” because it often has no warning signs or symptoms, and many people do not know they have it. That’s why it is important to check your blood pressure regularly and learn self-management tips-- see the local program below from the YMCA. 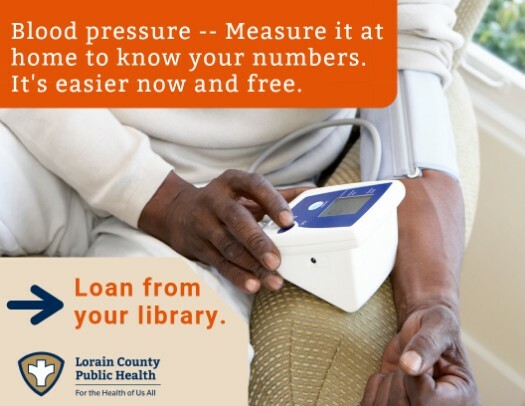 Visit our locator to find all the places in Lorain County where you can either borrow a blood pressure cuff, or get your blood pressure checked by a professional for free. The YMCA’s Self Monitor Blood Pressure (SMBP) Program is an evidence-based program that helps support people who want to improve their blood pressure. Participants are matched with a Heart Healthy Ambassador who checks in with them and helps support healthy behavior change. This four-month program focuses on monitoring blood pressure, making lifestyle changes, and sharing results with your doctor. Learn what else can be done to protect your heart or manage your blood pressure -- heart health tips. Find free fitness events in Lorain County. Find someone to help you quit smoking for good.